Ever since I posted Mangalorean egg curry that I served with Neer Dosa, I have been bombarded with requests to post Neer Dosa recipe. 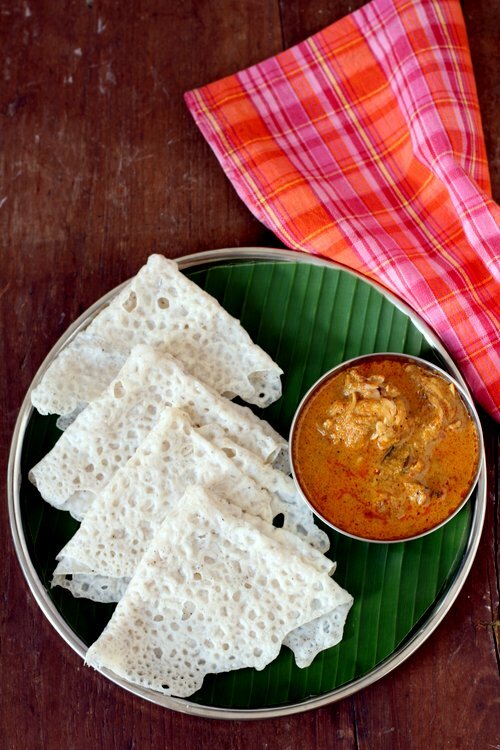 Last weekend, I prepared Neer Dosa and served it with Mangalore chicken curry. Neer dosa, a Karnataka breakfast fare, literally means ‘water crepe’ since the batter is of flowing watery consistency. Neer in Kannada and Tulu language means water. These white, light, lacy paper thin crepes are popular not only for the flavor but for the simple preparation and lack of fermentation. My Konkani friends gave me some tips on how to prepare neer dosa (called panpole in Konkani) that does not stick to the pan which I have listed in the ‘Tips’ section below the Neer dosa recipe. 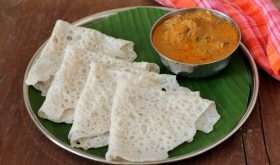 The vegetarians enjoy Neer dosa with spicy tomato chutney or coconut chutney, saagu, sambar, rasayana (mango with coconut milk) and a sweet mixture of jaggery and fresh coconut. The non-vegetarians enjoy it with chicken/mutton/fish/egg curry, egg roast or chicken/mutton/prawn sukka. One can enjoy these dosas even after they turn cold. Drain the water and grind the rice along with the grated coconut to a fine paste adding water as required. The batter has be like a flowing liquid (the consistency of water) and must be ground smooth. The batter when rubbed between your fingers should feel smooth and not coarse. Add salt to taste and mix well. To test the consistency of batter, the batter should not form a coating on the back of the spoon. If it does, add more water to the batter. It should appear like buttermilk consistency. There is no need to ferment the batter. You can use the batter immediately to prepare neer dosa. Grease an iron tawa and heat it on high flame. Do the sprinkle test. When you sprinkle a few drops of water on the hot pan, it should sizzle. Reduce flame and pour a ladle full of batter (a little more than 1/4 cup) from the sides of pan in a circular motion. Fill the center and holes if any with more batter. Place a lid over the pan and cook on medium high flame for approx a minute. The dosa will remain white and not brown. So do not overcook it. The sides will leave the pan and the upper lay will appear dry. At this point slowly lift the sides with a spatula, fold in half and again fold it in half to form a triangle. Remove from pan, place on a serving plate and serve the neer dosa with chutney of your choice, egg curry or chicken curry. Use aged rice. Sona masuri works well. Ensure that you season the pan well with oil before pouring the batter. If you do not season well, the dosa will stick to the pan. If the batter is thick, the dosa will stick to the pan. Each time you make neer dosa, enusure that you mix the batter well before pouring on the pan. Once you pour the batter, there is no need to add oil along the sides or in the holes like we do for rava dosa. There is no need to flip the dosa and cook the other side. Cast iron pan works best but you can use a non-stick pan too. If using a non stick pan, use a pan that has a lip (sides). Once the pan is hot, pour the batter in the center of the pan and swirl it all around so that it forms a uniform thin layer. Since the batter is of a watery consistency, you should be able to swirl it all around the pan. This dosa batter is not spread like a masala dosa batter. The batter is splashed on the pan like one would for rava dosa. Left over batter can be refrigerated and used the next day. If you have refrigerated the batter, bring it to room temperature and mix really well before preparing the dosa. Cold dosa batter will stick to the pan. Once you have made the Neer dosa, place it on a wide plate. Place the second Neer dosa next to it and not on top of it as it tends to stick when hot. By Sailu Published: July 15, 2014 Learn how to make Neer dosa recipe with chicken curry, a Mangalore style speciality. Easy South Indian breakfast dish prepared with rice & coconut. Thank you for providing an easy and instant item, helpful for a guest worker in the middle east, whose family lives in India. I take liberty to request you to clarify, if a deep cast iron tawa, or a flat pan is better. You did mention both. Thank you. Deep cast iron tawa is best. i’m gonna try this today. Will update u on the result! can this neer dosa be served with anyother Veg curry? 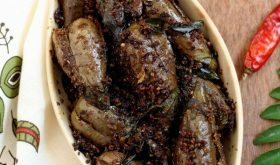 like Aaloo kurma please mention that also……. Can i use coconut milk? Going to try this soon. Thank you. how do you season the tawa?? you prepare some rotis or dosa or something?? Hello… I tried this recipe and after I spread the batter on the pan and once the cosa was cooked it cracked all over… Kelly it became small pieces.. Can you tell me what I did wrong,? THANK YOU FOR YOUR TIME TO SHARE YOUR RECIPIE .